Selling the house has been a lengthy process. One that we’ve been praying about for years and trusting God’s timing instead of our own. The first time we put our house on the market was summer of 2015. When we put it on the market we had no real plans on what to do if it sold but we were definitely thinking that we would find a HOUSE somewhere. To make a long story short, it didn’t sell (obviously). In 2016 we were fairly content. We did enjoy going to open houses and attending the Parade of Homes though. Talk about new idea overload. The Parade of Homes is even more dangerous than Pinterest! Who knew? After looking at hundreds of homes for sale, we decided to start updating ours. The updating was fairly inexpensive but it was definitely a labor of love. I am no Bob the Builder but I think I did a pretty snazzy job with that stain! Fast forward to 2017. This is our year! 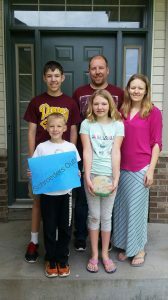 Since we all know that keeping a house in “show condition” with children (and husbands) is a HUGE cause of stress, I had this fantastic idea to put the house on the market during a road trip we had planned. I decluttered and cleaned the house the best I could before we hit the road and we prayed for God to take over our situation. My fabulous Momma went and did a final once over on the entire house and it was on the market in about four days. Since the interest in the house in 2015 was pretty much non-existent, our expectations were pretty low. Before we knew it, our email was flooded with showing requests and we had an offer within 48 hours. Multiple offers came through on our house in the next couple days and our stress level hit the roof! Why doesn’t anyone tell you it’s going to be stressful to actually accept an offer on the house that you purposefully put up for sale? Dustin, the business guy, was crunching numbers from the offers and I spent hours in prayer that we would choose the right family. I told myself I wasn’t going to, but I made things personal. I was on a constant loop of picturing the families and seeing their reactions to the news of their offer either being accepted or declined. Many prayers later we were at peace with the offer/family that we chose. They are a young family just like we were when we bought the house. I could picture their children playing on the swing set in the summer and running down the stairs on Christmas morning. They were definitely our people. In that time I must pack my entire house, move my family into our camper, drive 3.5 hours South to walk in my college commencement ceremony, drive 5 hours North for my nephew’s baptism, host a bridal shower, sustain my household while the hubs is out-of-town for business, and work full-time. It was a crazy four weeks of packing and moving. Since we were going on the road we decided to sell all of our large furniture. We listed it on Facebook groups and it sold quickly. (One of my friends took our couch so I still get to visit that sometimes)! Each person got a couple totes to pack their “keep” items in and the rest we were saying goodbye to. The kids and I packed totes and brought them to the garage and Dustin brought them over to storage when he was done working. We sent the sell pile to my Mom’s house for a garage sale and loaded the Yukon with multiple trips to Family Pathways. It seemed like a sea of never ending things. Many things I hadn’t seen in years. Many things I had to throw in a box and tape it fast. I was emotionally attached to things and that needed to change, oh my stars did we have So. Many. Things. We grossly underestimated the amount of things we had accumulated and also how long it would take to clear those things out. Dustin and I pulled an all-nighter to get the last odds and ends packed up and we were still cleaning when the couple came for the final walk through. 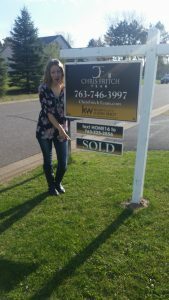 Although it was slightly embarrassing that we were still moving, the new home owners were wonderful. Dustin got to talk to them about some of the techy things in the house and he also gifted them with our huge desk (thank goodness they accepted because we didn’t know how to get it out). They graciously allowed us to return after the closing to retrieve our last few boxes. Closing on a house you have owned for almost 10 years is extremely bittersweet. We brought Logan home to that house, had birthday parties and holiday celebrations in that house, and spent a majority of our marriage in that house. We raised our babies there and letting go was hard. After the papers were signed, we headed to the bank, and then grabbed some lunch before I went to work. I had just enough time to shed a few tears before taking over my classroom. When I left that day, I no longer had a house to drive to. Reality was sinking in. We had just become a fulltime RV family.